Yesterday we received more than 1/4″ of ice during the latest winter storm to hit the East Coast of the United States. While it was beautiful to see, the ice proved problematic for people and wildlife. Thankfully, our power remained on, and I was able to work throughout the day on deadlines, with a couple of breaks to carefully tread outside with the camera. I kept the bird feeder full of seed and had many visitors, including the squirrels. I did have a pang of guilt from chasing them off the feeders in this weather, so I made amends by cleaning out one of the feeders and putting the old seed out in the yard for them. 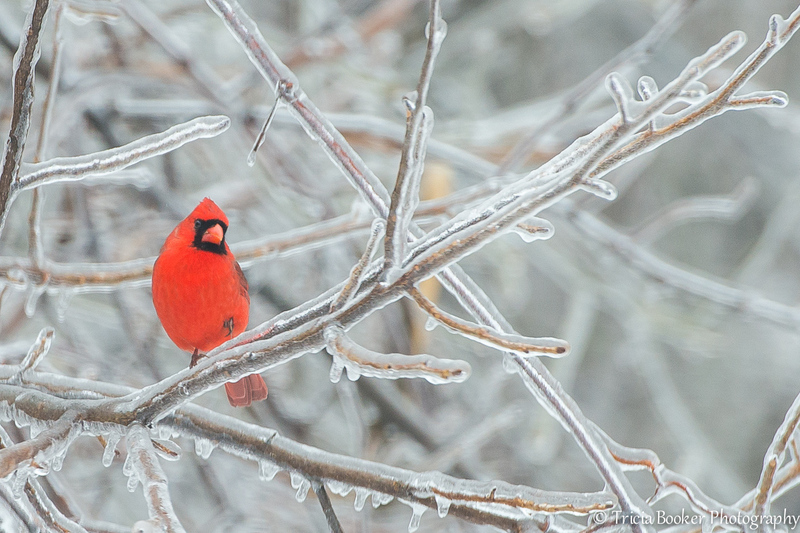 A flock of Cardinals provided some of the only color of the day, and I enjoyed photographing them against the icy trees. One of the images, similar to the one above, I posted on Twitter was picked up by meteorologist Bryan Schuerman here and used on the NBC TV station out of Hagerstown, Maryland. Kind of fun! Congrats on the pick-up. This is a great capture! Thank you, Victor! The cardinal was certainly a great model. Beautiful photo. Stay safe in the ice. Thank you! The birds were happy today that most of the ice has melted on the trees. One of the truest colors of winter–congratulations.Do you live in Maryland? We escaped the one inch of ice and got about 1/4 inch. But that’s Delaware. I used to see Cardinals all of the time and didn’t really appreciate them as much as I do now that I work from home. They brighten many gray days! I live in far Northern Virginia, so we tend to get more winter than the D.C. area. Thanks, John! I enjoy these birds for their great color. They can sometimes dominate the bird feeders, but I overlook that for their photogenic traits. I enjoyed visiting your blog today; you do wonderful work. I look forward to seeing more images from Ireland. That’s a country I do want to visit some day. Well done!! Great image of the cardinal. The UK’s still suffering from strange winter weather. Most days are too wet and dark to be able to get out and see the wildlife! Thank you, Sarah! We have had a very tough winter here on the East Coast. More snow and ice than typical. I’m glad for a few days of sun, but the temps have been brutal. I am revisiting my files more than usual! The whole weird winter is being caused by the jet stream running an unusual course. It’s milder than it should be here and the constant rain storms have been a nightmare in the south! Sorry to hear about your weather, although after this winter here on the East Coast I’m ready for a milder one. It’s snowing again as I type. But on a positive note, I’m getting better at metering for snow! I’m always having to alter my custom white balance when shooting snow scenes! We had a break in the rain today with some patchy sunshine but I know we’ve got more rain coming in. So many villages are already cut off! More snow in the forecast this week. This weather pattern really needs to change or else I need to just shoot black and white until it all melts! Beautiful capture of the cardinal. Stay warm. I appreciate the comment, David! Sadly, we ran out of propane today for the fireplace, but it’s to be refilled tomorrow. We still have electric heat, but it’s not quite as toasty as it was! Super photo Tricia and kuddos for your pickup! Beautiful image. I can see why they chose it for the television. Thank you! This red bird certainly brightened up my day! Hopefully those being hit by the latest storm in the mid-Atlantic have time to get out of harms way.